Gotrovo Treasure Hunt Game. Fun Scavenger Hunt for Kids of All Ages. Hours of entertainment, years of fun Banish those dreaded words I*m bored* with this exciting treasure hunt game. GoTrovo is an award winning family game that*s adaptable for intrepid adventurers and pirates of all ages - from little kids to adults who are big kids at heart! Winner of the Best Family Game 2017 Mumii Awards Spark your childrens imagination with this captivating challenge that combines brain-teasing clues with a sense of adventure. Follow the map, crack the clues and collect gold coins in the loot bag along the way. The game ends when you solve the final mystery to find the hidden treasure. Guaranteed to put smiles on everyone*s faces, GoTrovo is a fun activity for families to do indoors or outdoors. It*s the ultimate party game and is a thoughtful gift idea that makes a wonderful alternative to toys. 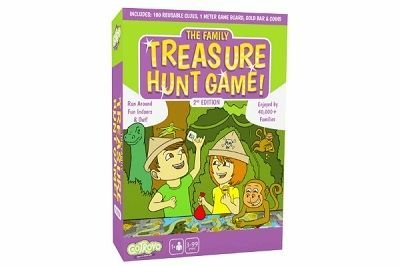 100 reusable clue cards (picture, word, riddle and role-play), double-sided treasure map, gold treasure bar, gold coins and loot bag.